Whistler Worth the Extra ? @Blewyn, depends a bit on when you intend going but no, not worth the extra schlep unless it's one you want to tick off. Maritime climate can either bring epic conditions or rain and I've experienced both there. Blewyn, surely you are going round the wrong way! Dubai to Vancouver: 7285 miles. Dubai to Japan: 4,839 miles. Whistler has a European style mountain with North American Efficiency. I'd say the biggest bonus are the safe off-piste bowls at the top. If you like off piste, steep and deep but want to do it in relative safety then Whistler is definately for you. To be honest, I've skied a lot of resorts in Europe and the Whistler all-round holiday experience is better - Accomadation tends to be bigger, better equiped and there's lots to do in the town - although it's likely you'll have to use the ski bus. Little or no queuing, staff trained for customer service and every type of skiing you could ask for. If you're crossing an ocean to get there then it really makes sense to spend a couple of days in Vancouver which is a fabulous city. Hot Tub suite at the Sundial or a room at the Four Seasons ? If you remember, the 2010 Olympics were in Feb and it was dire. Weather / snow conditions tend to be a bit of a lottery with Whistler - we have been extremely lucky whenever we have been ... fantastic skiing over Christmas in 2006 and an epic / powder-filled month in March 2012 stand out. Blewyn, wasn't just suggesting wrong direction, also suggesting wrong resort. Forget Canada - try Japan. That might really be worth it. @Blewyn, what sort of skiing are you after? Good point although it was good higher up. I spent two weeks in April and it was fantastic higher up. To be honest I spent my time higher up on the steeper stuff and wasn'tso concerned with the tree skiing lower down. Another thing worth mentioning is the Canadian Doallar which is not as strong as it has been and makes it better value than in recent years. We found a private condo online that would have fitted 10 Avoriaz style rabbit hutches in it for not much more money. It also had its own outdoor hut tub. The only expensive thing was the lift pass. A regular coach service runs from Vancouver Airport to Whistler too making trasnfers very easy. @Blewyn, May not be much of a $$ saving but you can easily drive from Seattle to Whistler. I agree the Whistler snow is a lottery. The resort / mountain is very low starting at 660m (up to 2200m very briefly) and it located in temperate rain forest. This means that unless it is cold enough the snow just melts, or gets rained into slush. I have noticed that the WB website have removed the historic snow record, probably because it was showing steady downward trend. For me skiing it about off piste soft snow, and the pistes are just for getting to/from the skiing. So in theory Whistler should have been perfect for me, but in 8 weeks over the last 4 years, I only had decent conditions for 1 week. If you just want piste/park skiing then Whistler maybe a good choice. The service everywhere is excellent, the lift system adequate, it just needs steady consistent snow. As others have recommended, I've given up on Whistler this year, and will be going to Japan instead. Oh that's definitely on the cards...just in the mood for a western, english-speaking ski hol this year, and never been to Canada. You will be fine. I too like the no language hassle and the service ethos needed to keep the US people happy is brilliant compared to France. We have normally gone in March/April and never had rain. Though we missed out last year and it would have been hopeless so that was lucky. The pedestrianised village and great food/bars helps get us back there regularly. The flight for us is all day into the wee hours our time, which is the same going to europe really still loose most of the day. Overnight on way back so get to ski last day. But much bigger commitment for you with those timings. Not sure what you mean by dire. The events in Whistler were only delayed for too much snow or visibility issues. I don't go that fast so the vis is fine for me - had worse in Italy. The snow events that they put on in Vancouver were crazy as it was just slush. No they haven't http://www.whistlerblackcomb.com/mountain-info/mountain-and-weather-stats though it is right at the bottom of the page. It also backs your suggestion of some poor years and going down. They did still get nearly 7m of the stuff though over the season (if you believe them). It was looking dire for the season to actually open on time, but then some huge dumps and they open early. Fickle thing the weather. If it is cold enough they have plenty of cannons. What really kills them is too warm. Obviously cannons are not going to give you powder up in the bowls. We went at New Year one year and there was too much snow so they had shut the top lifts down as too much avalanche risk. @Jake43, My mistake, but I'm pretty sure it wasn't there a month ago. I hadn't checked back as I'm not going this year. I agree that 7m is a decent snow fall, and an epic one for many European resorts, but the BC weather systems can deliver 4-5m in one month, so for Whistler it is very poor. They measure and report the snow fall at the Pig Alley weather station, which is in a small protected valley. What they don't do however is report the base, which is what is important (as I believe most European resorts do). When I go skiing I want to know how much snow is between my skis and the rocks/trees underneath. Telling me that 90cm of snow fell in the last two weeks, or 500cm since the start of the season is pretty pointless as it is usually gone after 1 or 2 days, and you are back to the original base of 15-20cm. If you want to go to Japan because you liked last season's conditions there, then I'm sure you'll be fine. This season, BC's already being pounded, so it's going to be epic there too. It's not a zero sum game. Ride them all, I do. But you're comparing apples with oranges. I drove on through Whistler last season as conditions were significantly better up the road (significantly better than almost anywhere on that continent or this). The season before it was what Whistler locals describe as "brutal". That means: the resort is completely white, there's snow everywhere, and you can easily ride down to the lowest lift without encountering a rock. The season before was epic, with "blower" powder at the coast, which is a rare thing. I suppose I could have hopped on a plane to Japan, as they had better snowfall, but then I had plenty of snow, albeit not as deep as a standard season. I don't think the OP was expecting us to forecast the weather though. If you can do that, then you should be making money from it, not wasting your time on here. I've flown and driven to YVR via SEA - both are a pain. Driving is marginally better although the customs is a nuisance and check that the hire car company isn't going to stiff you. Any transfer increases your gear-mislaid risk. Overall, my personal preference if I can't get non-stop is to transfer somewhere other than SEA, as that's just annoyingly close and gets skunked by weather and it's just not where I want to break a long haul flight. The coffee isn't bad, mind. If you're going to the US (got your ESTA...?) then you may as well bag Baker and all that stuff down there, if it's a year when the Coastal resorts are good. Whistler snow pack compacts a lot, but that's true of everywhere. You have to ride it as it falls. People who care will know this. @Blewyn, what sort of off piste though? On our second heli trip we got massively better steep skiing in Whistler than we got on a full week of down days looking mournfully out the window of the heli lodge at the fog. Steep, or gladed trees, great, Whistler a good plan. Not so steep and powder? Japan. Whistler is friendly of course... but you'd be somewhat mad to pass up on Japan from where you are. Have you skied there? So far I've been once and only to relatively small Myoko, and it was lovely. 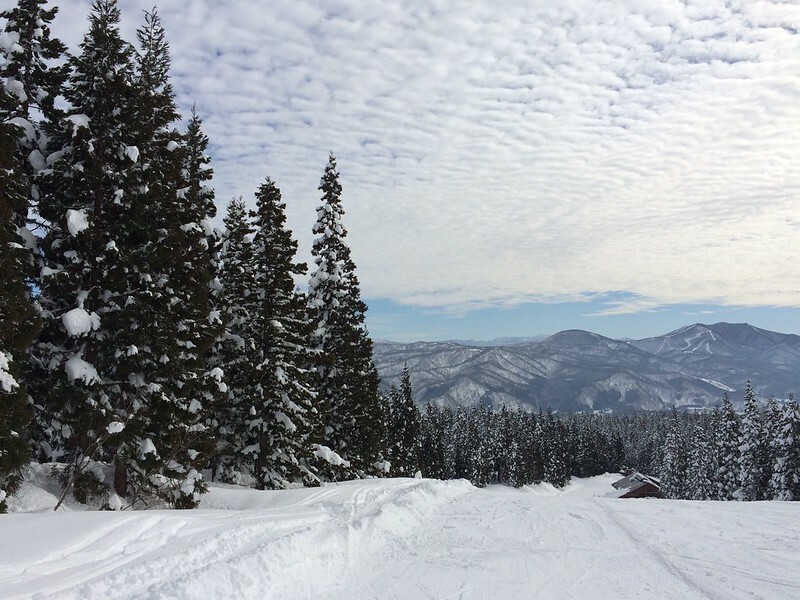 Very friendly, and you could easily cover two resorts - start at Myoko then on to a larger one like Hakuba. 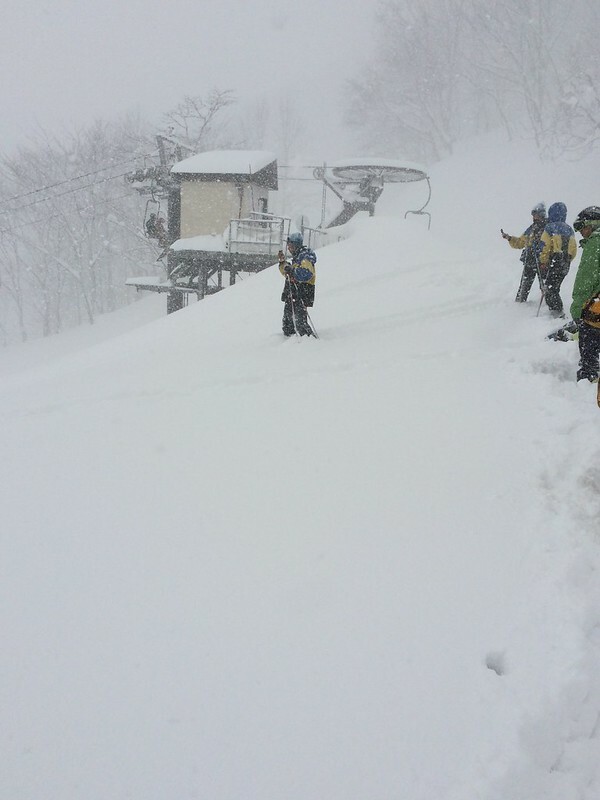 I used Japan Snow Access online (I'm in Thailand) and AMy Shimizu was tremendously helpful. We used (Amy booked for us) the Chuo Taxi transfer rather than trains etc due to skis and boots... picked up in a van at Narita with some others, the two of us transferred to a Prius later on - all like clockwork, and the same precision on the return. Also booked a day trip to the Hot springs where the 'Snow Monkeys' do their bathing... through IXSM. We stayed at Furaya hotel in Myoko - thye have some Aussies there as 'hosts' also so definitely no english issues. Hotel has its own hot spring baths, and a couple of rooms with their very own hot spring baths... they were already booked unfortunately. @PowderAdict, Yep agreed amount falls not too relevant but you mentioned it, and I was interested to see what last year topped out at so had seen it. They are reporting base on the main snow page as 86cms which is not bas as they had none 2 weeks ago! As @philwig, says ride it when it falls - which is no good to us folk who have to book months in advance and chance it. Not had a bad holiday there yet. Happy going back - as much for the steak in Hys than hoping for powder. Not sure what you mean by dire. If I remember rightly it was pretty warm and claggy, especially for the slalom events. All I'm saying is that its a long way to go for potentially variable weather conditions (much more variable than say Colorado or Utah or interior of Canada). On my visits it was either banging down with snow or peeing down with rain and not much in between. I think its maybe hyped beyond its reality. I too like the no language hassle and the service ethos needed to keep the US people happy is brilliant compared to France. We have normally gone in March/April and never had rain. Though we missed out last year and it would have been hopeless so that was lucky. For the Olympics, all the events were from mid-mountain down, and the slalom was one of the lowest courses run. We got to Whistler just after the Olympics (the Paras were on) and conditions from the top to mid-mountain were just fine. (I only use the lower trails to get back to the base, anyway, unless it's a total white-out high up). "Happy holidays, eh!" (get it right). @Pruman, I would love to go to Colorado and Utah but want a direct flight from London at least. Every time we look at Banff we just can't bring our selves to consider a long bus ride back and forth and a town that is much more spread out as it is a proper town. Whistler is Disney really for skiing. Never had a bad experience with the snow/weather over 10 visits - but I can see why it would put you off. Yes. I went in the summer and it's undeniably the greatest place I've ever visited on earth. Can't speak for the skiing, but it's like an action sports Disneyland. So much so, I came home, quit my city job and moving to the mountains. In the words of an Oregon based sports company, just do it. BA direct to Denver and next May I think Delta start direct to SLC. For Banff I would always hire a car anyway. I've never understood the whole bus thing. Banff is actually a lot easier to 'do' than you might imagine. Been a couple of times (and taking our 5yr for his first skiing trip!). We once went for just one weeks holiday - when we compared prices and quality of accomodation with some European resorts it just made sense!! Flight times with Air Canada are sensible, leave LHR 10ish, land Calgary lunchtime, their time. Easy drive (90min or so to Banff), sort ski hire out etc, quick afternoon nap, dinner, early bed and ready to ski the next day! The town isn't that big to me, most accomodation on Banff Avenue is easy walking distance of downtown and there is a very efficient local bus service. Also most out of town accomodation have their own transport downtown. The buses to resorts work much better than you might imagine. Reliable, on time, proper coaches with luggage space underneath, not standing up holding skis etc. The scenery is simply amazing. We've usually used the bus to Sunshine or Norquay and driven ourselves to Lake Louise. The drive, to me, is part of the experience. It's the closest you can get to 'guaranteed powder' on the planet without booking two days before travelling. Not really, 7m is average or worse for much of Europe! It's also the little things- snuffle sations at lifts (free tissues) - free suntan topups outside some restaurants. It's just a different feel to your typical rip off high altidude European resort where you pay for a 7 Euro beer, where you served by someone who looks at you like you're ruining their day. Above all though, it's the skiing. Imagine shoving St, Anton on top of Megeve's hill's adding an amaizing lift system, controlling the Avi risk and leaving all the top bowls unpisted. An the snow on top is so deep it makes minin cliffs to jump into the powder bowls below. The onlt downside is the whole thing is a bit Disney, everything owned by one company so you don't charm of Europe but everything else is epic. I wouldn't narrow it down to just Whistler......although I would think it is most peoples wish list. There are so many areas and resorts over there to chose from. weekend crowds (still minimal compared to Europe) chairs are loaded to capacity i.e. a four man chair will have four people on it and not the European way of sending it up with one or two that so often happens. Europe is a great place to ride but given the choice I would definitely go to America.